While this wasn't in our ward, I am always impressed to read about our Fire Services' capabilities. Since the beginning of this term, I have been consistently impressed at the professionalism and expertise demonstrated when I visit the site of a fire. With its permission, I've posted OFS' most recent news release that describes their capacity to deal with structural collapses. Ottawa Fire Services recently attended incidents involving a structural collapse. Ottawa Fire Services manages a large number of emergencies and we want residents to know that we are skilled, trained and accountable to provide the most effective emergency response. OFS is in a position to do so because we have a number of specialized teams such as our Technical Rescue Team. This group specializes in Structural Collapse and will respond should you ever find yourself in an emergency where a structure has collapsed. Earthquakes are not the only reason structures collapse. For example, incidents such as vehicles driving into buildings would require the Technical Rescue Team’s expertise as would building materials giving way in a structure. 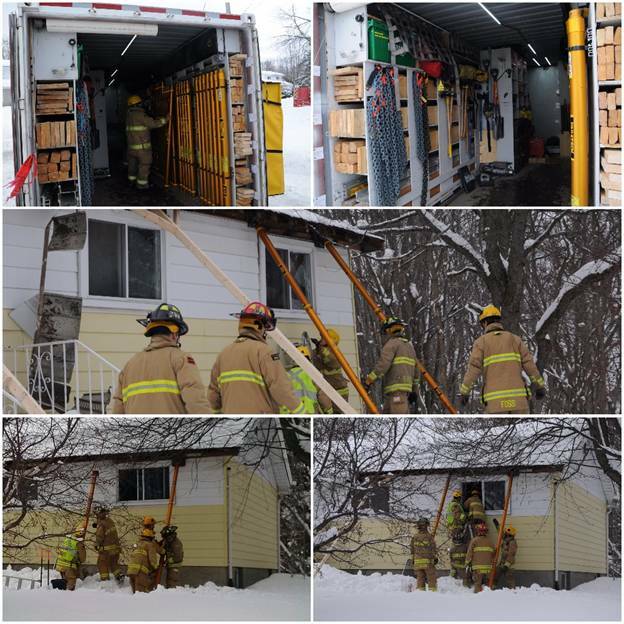 Ottawa Fire Services (OFS) was contacted at 1:49 p.m. to assist a contractor who had started to stabilize a home on Philnor Street in Ottawa. The occupants had vacated the property the night before when the ceiling had collapsed in one part of their home. Thankfully no one was injured during the evacuation. However, when contractors attempted to secure the structure on Thursday it began to give way and it was in danger of a full scale collapse. OFS immediately deployed the Technical Rescue Team. Firstly, firefighters would not only stabilize the dangerous structure but would also ensure the contracting staff would not be injured. In addition, firefighters were tasked to retrieve some essential personal items that remained in the crumbling home. Medications and identification were left behind when the family had to quickly evacuate the previous day. Firefighters arrived on Philnor Street to find the outside walls bowing dangerous at the front of the home. Wood supports had been installed by contractors but specialized shoring was quickly installed by OFS crews. A strategy was devised to enter quickly into the unaffected portion of the home to retrieve medications. Identification and other essential items were located in a severely compromised portion of the home. It was deemed unsafe to enter by the incident commander and firefighters ceased operations because their safety was at risk.